Aside from Dots, Levels, Colors, and Shapes mods can also have different Sets used to create Set Bonuses. Mods can be farmed through the Mod Challenges for their specific mod set and include: Health, Defense, Critical Damage, Critical Chance, Tenacity, Offense, Potency, and Speed. Mod sets are important because matching sets can provide bonuses to character stats. Mods sets can provide bonuses through 2 matched sets or 4 matched sets and the bonuses can be applied to mods between Levels 1-14 or max bonuses for matched Level 15 mods. Set Bonus information is shown at the bottom of an individual character’s mod screen. Some set bonuses require 4 mods to make a complete set, while others require just 2 mods. This means that in order to get the +15% Crit Dam mod set bonus, a total of 4 Crit Dam mods are required. For the mod sets that require just 2 mods, up to 3 full sets can be made. For the mod sets that require 4 mods, a single 4-mod set can be made and then an additional 2-mod set can be added to a character. Max set bonuses can only be made when all the mods in the match are at Level 15. In the below example, Boba Fett has 4 Crit Dam mods and 2 Tenacity mods. The Tenacity mod set is receiving the Max Set Bonus (noted by the gold lines connecting the mods) because both the circle and the cross Tenacity mods are at Level 15. 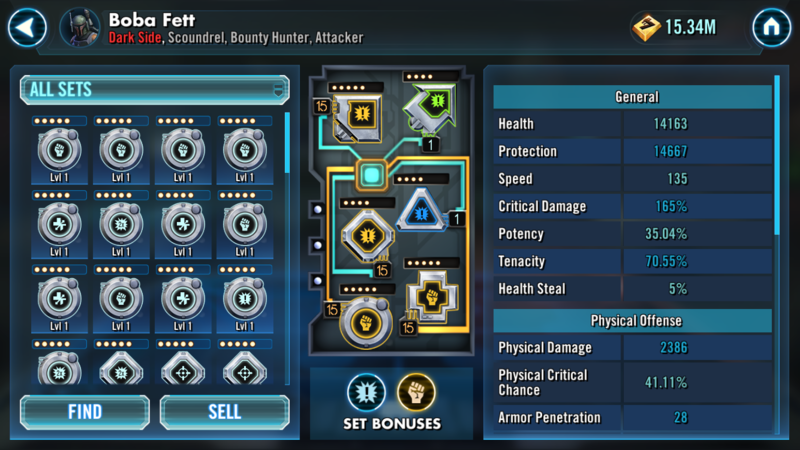 Even though 2 of 4 of the Crit Dam mods are at Level 15, Boba Fett is only receiving the +15% Crit Dam bonus instead of +30% because 2 of the Crit Dam mods are only at Level 1. In order for Boba Fett to receive a +30% Crit Dam mod set bonus, all 4 Crit Dam mods would have to be at Level 15.